Thanks to everyone who came out to an event this year, and we hope to see you at an event in 2011! 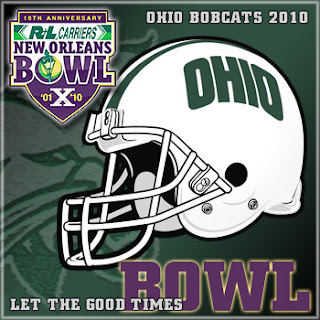 Get ready to root for your Ohio University Bobcats in the New Orleans Bowl on Saturday, 12/18. Kickoff is at 9 p.m.
Game watch parties are happening in Brunswick, Lakewood, and Willowick — come out and cheer for the 'Cats with fellow OU fans! No fees are associated with these events. Food & drinks are on your own — pay as you go. Questions? Contact Andrew Banc: (440)347-0368; andrew_banc@hotmail.com. Questions? Contact Amy Hollis: 440-220-2837; president@clevelandbobcats.com. Questions? Contact Dave Harley: 440-759-3461; DHarley@ACEcleveland.com. Get together with OU fans in your area and cheer for the 'Cats on Saturday, December 18. Kickoff is at 9 p.m. There is no cost associated with these events; pay as you go. Your OHIO Bobcats are headed to the Big Easy! OU has been selected to face the Troy Trojans in the R+L Carriers New Orleans Bowl in New Orleans, Louisiana (Louisiana Superdome) on Saturday, Dec. 18 at 9 p.m. ET. A Cleveland-area game watch party is in the works! Details will be posted as they are available. University Jewish Life on Campus Alumni Association, and the Carter Nedley Foundation. simple cheek swab and be among the thousands of possible donors in the the Gift of Life Registry. You can save a life! Danielle Leshaw, Director,Hillel at Ohio University at 740.592.1173, or leshaw@ohio.edu, or Hillel at OU's Bone Marrow Interns, Kara Leyser at kl256308@ohio.edu and Hannah Giterman at hg314808@ohio.edu. For details about bone marrow donation and to learn more about Gift Of Life, visit GiftofLife.org. Let My People Know is a project of the Jewish Federation's Centennial Initiative for strengthening and growing Jewish Cleveland.